Bu¨hler is a specialist and technology partner for plant, equipment, and services for processing basic foods and for manufacturing advanced materials. The group holds leading market positions worldwide in technologies and processes for transforming grain into flour and feeds, making pasta and chocolate, as well as in the field of aluminium die casting. The core technologies of the group are in the field of mechanical and thermal process engineering. With its expertise and over 150 years of experience, Bu¨hler time and again rolls out unique and innovative solutions for its customers, helping them achieve success in the marketplace. Mechanical ship unloaders are an important part of Bu¨hler’s product range. Bu¨hler has long and intensive market experience, and has developed a broad and extensive product portfolio. Within that portfolio, the Bargolink and Portalink models offer a versatile solution for its customers who need fast, optimal and efficient ship unloading. The Portalink, for example, is a mechanical unloader for seagoing vessels of up to 125,000dwt, at capacities ranging from 300tph (tonnes per hour) to 1,500tph. The Bargolink, also a mechanical unloader, has been specially developed for use with river barges, and has an unloading capacity of 300tph. Due to the low conveying speed of the vertical chain conveyor, Bu¨hler’s mechanical unloaders are excellent for unloading free- flowing products such as wheat, corn, soyabeans, wood pellets, etc. But they also excel in the unloading of mealy products such as soyameal. With the use of specially designed equipment such as the proven loosening screws, not only is unloading efficiency increased, but also the uniformity of the size of the unloaded product increases, reducing the risk of blockages further in the system. Major clients for Bu¨hler’s mechanical unloaders are grain terminals, and larger end users. For example, San Miguel has invested in a Portalink 600, with barge loading facility, completed in 2013. The Portalink has a nominal capacity of 600tph for wheat and can handle vessels up to 65,000dwt. Prima Flour Mills in Sri Lanka has installed a Portalino Combi on its multipurpose jetty and has installed a Portalink 800tph on its main jetty. Mechanical unloaders in particular — such as the Portalink range — are setting market standards in terms of low energy consumption, high operating efficiency due to easy handling for operators, high availability due to reduced maintenance time and low wear- and-tear. This all means that buyers can expect a short return on investment (ROI), making them an excellent choice economically. traceability. This results in a reduction in the time needed to search for errors or train new staff to understand the equipment, greatly improving ROI. a midsize 600tph Portalink in Asia. With more than 100 years of experience building mechanical unloaders, Bu¨hler has a large and global base of installations. With their high and reliable quality, many of the older mechanical unloaders are still in use even after 50 years, and form the backbone of many companies. To even further extend the operating life of its equipment, Bu¨hler has developed several service packages. One of the new service packages is a complete or part retrofit of the marine leg, the heart of the mechanical unloaders. With a less-than-optimal functioning marine leg, not only is performance reduced, but also unexpected breakdowns result in unscheduled and expensive repairs. With the retrofit offered, Bu¨hler diagnoses and intervenes ideally before or when interruptions happen, thus reducing risk and or costs. Another service package which Bu¨hler provides to its customers is an upgrade of the operating system of its unloaders. With an upgrade of the operating system to the latest Bühler standard, not only is the outdated and defective hardware replaced, but also a complete new revised operating system is installed. The latest operating system has increasing functionalities such as a touch panel directly presenting error messages, individual selection of each motor and sensor saving precious time during unloading "
Every day, billions of people use Bu¨hler technologies to satisfy their basic needs for food, mobility, or communication. With its industrial process technologies and solutions, Bu¨hler makes a significant contribution to feeding the world’s population while focusing on food safety and security. Around 65% of the wheat harvested worldwide is processed into flour on Bu¨hler mills. The company’s contribution to the global production and processing of rice, pasta, chocolate, and breakfast cereals is equally substantial. Furthermore, Bu¨hler is a leading solution provider of die casting, wet grinding, and surface coating technologies, with a focus on applications in the automotive, optics, electronics, printing, packaging, and glass technologies. The solutions provided to these industries are characterized by high energy efficiency and sustainable mobility. As a leading technology group, Bu¨hler invests up to 5% of its turnover in research and development every year. Bu¨hler is proud of its Swiss roots, with 10,600 employees at some 140 sites generating sales of CHF 2.3 billion. As a family-owned company, Bu¨hler is particularly committed to sustainability. The environment is constantly changing and there is a need to become increasingly aware of the problems that surround it. This is why Bedeschi always pay attention to environmental issues, basing its projects on the stability and sustainability of the surroundings. do this are becoming bigger, so the modern port has to be equipped with all kinds of machines like shiploaders, ship-unloaders, cranes, conveyors, etc. to be able to complete the vessel’s loading/unloading process in the minimum time. To guarantee efficiency in the ports it is necessary to optimize the position and the volume of the material that is stored and in transit, waiting to be shipped, to have adequate machinery to reduce the time of loading and unloading of the ships, and the delivery of the raw material. It is also necessary to organize the layout of the terminal in the most functional way and to reduce the number of operators needed through automation of the process, creating eco-friendly terminals by using dedusting equipment. Thanks to its wide experience and knowledge in material handling, Bedeschi is successful in all of the above mentioned aspects. For example, when considering the bucket chain continuous ship unloader (CSU), all the solutions that Bedeschi proposes, and the executive design, are developed with the utmost care to dust control. The CSU will travel on rails and will be travelling and luffing boom type, it will be equipped with a bucketwheel elevator with continuous rotation for digging, with belt on the boom and central hopper to unload on a feeder that will load the pier conveyor. When unloading, the material reclaimed by buckets will be luffed to the unload point, on the top of the elevator, and unloaded on a rotating plate which, independently from the rotation position of the elevator, will convey the flow on the boom belt. From the boom belt, through the central hopper, the material will be unloaded on the belt feeder under the hopper that will convey onto pier conveyor. The proposed design with fixed foot will allows to extend the elevator enclosure, leaving the foot only on open air. While in operation, even at the real beginning of the unloading, the elevator foot is almost entirely inside the hold avoiding any possible dispersion. Once the material is inside the buckets, the entire stroke is protected. Drive sprockets of the elevators will be equipped with a suitable device to avoid any possible egress of material inside the elevator enclosure. CSUs are normally compared with a traditional grab type ship unloader. While the grab type ship unloader, even if equipped with ecological grabs, does not make it possible to completely eliminate dust dispersion during the transfer from the hold to the hopper — especially in windy conditions — with the CSU the route of the material is completely enclosed and the transfer points are equipped with dedusting systems. This means that, once reclaimed by the buckets, the material can be fully enclosed without any possible dust dispersion. Particular care will be taken to avoid any material accumulation inside the elevator in order to avoid any possible material falling during machine transfer operations. The unloading chute will be closed, with sealed inspection doors. This is why the CSU ensures a homogenous material flow, with dust kept to an absolute minimum. Going green and sustainable practice is now seen as an essential part of any business in the bulk industry. Considering the fact that port’s infrastructures which consists of the land and space necessary for operations is expensive, Bedeschi is able to help the client by providing compact, functional, and eco-friendly machines that are able to adapt to a smaller space but are still able to offer the high volumes requested by the client. Bedeschi is also able to minimize environmental problems due to dust emission by stacking material in an enclosed warehouse. In addition, all of the machines have dust filters created by the Bedeschi affiliate company CTP, therefore Bedeschi Group is able to offer totally dust free environmental friendly solutions. Ship unloaders are a well-developed technology that work continuously and reliably. While there are different types suited to different materials, a common factor is the need for effective control and monitoring to be maintained at all times to both ensure trouble-free operation and to calculate the weight of cargo being unloaded. Real-time monitoring data from unloading systems is key for safety, operational and commercial reasons. When it comes to safety, an overloaded machine can be dangerous to personnel, or could break down and bring operations to a costly halt. In operational terms, unloaders need to run at optimum speed to minimize ship turnaround times, while also controlling the rate of delivery of materials to the dockside facilities. Live load data can allow operators to calculate the amount of cargo moved, the time to completion of each operation, the number of trucks required for onward shipment, etc. There is also a distinct commercial requirement for effective monitoring, as the value of many dry bulk cargoes is calculated from its weight. Real-time data from the unloaders is collected by having sensors monitoring the critical variables — in this case the torque on the drive shafts, the speed of the motors and the drive power.All of this data fed back to the control system can help in deriving load values on conveyors, stress and potential overload in unloading systems, and weight of bulk product moved. However, torque data can be hard to collect, with traditional technologies introducing as many problems as they solve. Because the shaft is rotating, wires attached to it would wind up and snap, so a special way of monitoring it is required. The usual solution is to use slip rings, but these are expensive, difficult to set up and far too delicate in use for dockside applications. An emerging technology that is increasingly being integrated into unloaders is wireless, non-contact digital torque monitoring, an area of specialism for Sensor Technology. These sensors measure the work being done by the motors and drive shafts of the unloaders and the data is automatically and instantly converted into cargo weight figures. With over 20 years of research and development into digital non-contact torque monitoring, Sensor Technology is at the forefront of this technology. Operating out of the heart of Oxfordshire, Sensor Technology is an acknowledged leader in the manufacture of quality torque measurement solutions and wireless load sensors. It has a global network of distributors assisting sales, and a network of world-renowned technical experts assisting in the development of technology. Sensor Technology’s non-contact torque monitoring transducer,TorqSense, is based on the patented technology of measuring the resonant frequency change of surface acoustic waves (SAWs) generated by rotating shafts. It’s a proven technology that has solved torque measuring challenges in a host of industries. TorqSense torque sensors use two tiny SAW detectors made of ceramic piezoelectric material containing frequency resonating combs. These are glued onto the drive shaft at 90° to one another. As the torque in the rotating shaft increases one comb expands and the other contracts proportionally to the torque being applied. In effect, the combs act similarly to strain gauges, but measure changes in resonant frequency. An adjacent pickup emits radio waves towards the SAWs, which are then reflected back. The change in frequency of the reflected waves identifies the current torque. This arrangement means there is no need to supply power to the SAWs, so the sensor is non-contact and wireless. Applied to mechanical ship unloaders, the technology is bringing distinct advantages. A process that was once regarded as very difficult to monitor can now be optimized for the highest levels of productivity with the lowest cost. 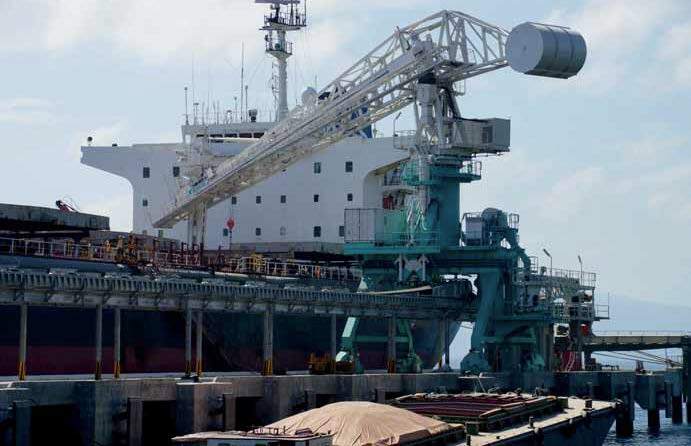 Not only does it offer many benefits for conveyor dry bulk unloading, it has also been adapted by Sensor Technology recently — in the form of the wireless LoadSense transducer — for use with straight-line load monitoring, such as is required by cranes and hoists as they lift cargo to and from ships. This means that all cargo handling techniques used in any given situation can be monitored by the same system, which will lead to significant savings in management time and costs as two or more reports do not have to be integrated. To date the technology has been successfully applied to all forms of unloader — bucket wheels, flighted vertical conveyors, augers, horizontal belt conveyors and pneumatic systems, and Sensor Technology has seen its torque monitoring technology used in the transfer of grains, minerals and other dry bulk materials from ship to shore. The unique principle of operation, being non-contact and maintenance free, has seen a rapid adoption in a host of dockside unloading applications around the world, as more and more operators see the commercial advantages of improved quality of information to their control systems. It is helping to minimize the amount of time ships are in dock — and therefore not earning — by optimizing the speed and reliability of unloading processes, while also helping companies to maximize profitability by delivering more accurate weight information on bulk goods. The extreme conditions in the heavy industry require reliable and safe industrial applications. Individual customer solutions and all-round service also play an important role in this context. As a renowned supplier, Johannes Hu¨bner Fabrik elektrischer Maschinen GmbH offers encoder systems for heavy duty applications, including ship unloaders. Guaranteeing the safety of both humans and machines is an extremely important factor in heavy duty applications. And it is not only the environmental conditions that can cause dangerous situations.The equipment needs to be protected in some applications should dangerous situations arise, for example as a result of overspeed or collision damages. Johannes Huebner Giessen presents the new series of absolute encoders with SIL CL3 certificate for deployment in applications requiring certified compliance with functional safety requirements. Specifically developed for heavy industry the AMP(H) 41 (PROFIsafe via PROFIBUS DP) and AMPN(H) 41 (PROFIsafe via PROFINET IO) are certified to DIN EN 61508 up to Safety Integrity Level (SIL) CL3 and to EN ISO 13849 up to Performance Level (PL) e. Utilizing these functionally safe encoders exempts the user from having to provide separate verification of the functional safety of the position sensors. Different versions of the encoders are available:AMP 41 and AMPN 41 with solid shaft (14mm diameter) as a flange (B5) and flange-foot version (B35) to mount the encoder using a coupling as well as the AMPH 41 and AMPNH 41 with a continuous hollow shaft (20mm diameter) to mount the encoder directly onto the drive shaft. The devices with a PROFIBUS interface and those with a PROFINET interface use the PROFIsafe protocol for data transmissions. The total resolution is 28 bit, 13 bit singleturn resolution (8192 steps/revolution) as well as 15 bit multiturn resolution (32,768 rotations). An additional incremental output offers 4,096 pulses. Featuring extensive diagnostics functions for error detection the certified functionally safe encoders are manufactured in an audited development and manufacturing process. That guarantees maximum safety! “In heavy industry it is imperative that high-performance and robust construction are not mutually exclusive,” explains Thomas Brandenburger, head of the Product Management department. The new encoders were specifically developed for deployment in SIL 3 applications in heavy industry such as in dry bulk and container handling equipment, in steel and rolling mills, in mining industry as well as for general deployment in applications in extremely harsh operating and environmental conditions. Features such as a thick-walled aluminium casing, large ball bearings with high dynamic load rating and corrosion-resistant material with an additional protective coating ensure the encoders are ideal measuring devices for heavy duty applications in operating temperatures from –25°C to +70 °C. Furthermore, all devices are equipped with secure bolted connections to prevent them working loose under vibration loads as well as feather keys for form-fit shaft connections. For hollow-shaft assemblies the robust, long torque bracket arm ensures a higher signal quality. The available degree of protection up to IP66 and the quality of the materials used mean the new absolute encoders are also suitable for deployment in salt-laden environments. Due to the extreme conditions faced by humans and machines alike, particularly stringent safety regulations apply to plants and systems operated in heavy industry. To fulfill these requirements the specialist from Giessen offers the electronic overspeed switch EGS(H) 41 that operates independently from the closed- loop speed control system. The EGS(H) 41 is certified up to Safety Integrity Level (SIL) 2 in accordance with the international standard IEC 61508 as well as up to Performance Level (PL) d to DIN EN ISO 13849. It is also the only overspeed switch worldwide certified to this standard. Consequently, it guarantees the operator the highest level of plant safety and serves to protect personnel. With an integrated sensor, logic circuitry and an actuator the EGS(H) 41 functions as a complete system. The speed is sensed, evaluated and switched in sequence. The safety device is equipped with two separate, electrically isolated and, as a consequence, complete switches to monitor speed that can be programmed independently from one another to monitor overspeed and underspeed from 0.5 rpm. In this instance the electrical insulation generates a huge advantage in comparison with mechanical centrifugal switches, which would need a second device for the same function. A further switch automatically monitors safety functions relevant to the hardware and software modules (diagnostics). The EGS(H) 41 also features integrated overcurrent detection and monitors the status of the wear-free, electronic switching contacts as well as optional standstill and slip monitoring. Encoder concepts from Johannes Huebner Giessen are customized to meet individual customer requirements. Design engineers determine the installation conditions on-site and support the customer throughout the calculation and design phases, during production and delivery through to final assembly and installing the encoders. High resistance to external loads such as vibration, shock and dust as well as robust, fully encapsulated electronics mean the encoders are predestined for deployment in heavy industrial applications such as rolling mills, in the mining industry and harbour cranes. Their high degree of protection from IP66 to IP69 is a further distinguishing feature that also underlines their suitability for applications in heavy industry.